IRDA has released its annual report for 2014-2015 couple of days back, which contains Insurance Claim Settlement Ratios 2014-2015. While claim settlement ratio is not single factor to consider insurance plan, these highlights would help you to pick-up right insurance plan. What are the highlights of the IRDA annual report of 2014-15 pertaining to claim settlement ratio? Which are the best insurance companies from the published list of IRDA claim settlement ratios of 2014-2015? Also Read: Should you opt for Bharti Axa Invest Once Insurance Plan? If you are already familiar about this, you can skip this section. Claim Settlement ratio is the ratio arrived by comparing the total claims paid over the total claims received by the insurance company. If an insurance company has received 100 claims, but paid only 90 claims and rejected 10 claims, claim settlement ratio is 90%. High claim settlement ratio company is good for considering a term insurance plan. Hence, individuals would prefer high claim settlement ratio insurance companies so that their claim is not rejected in the future. 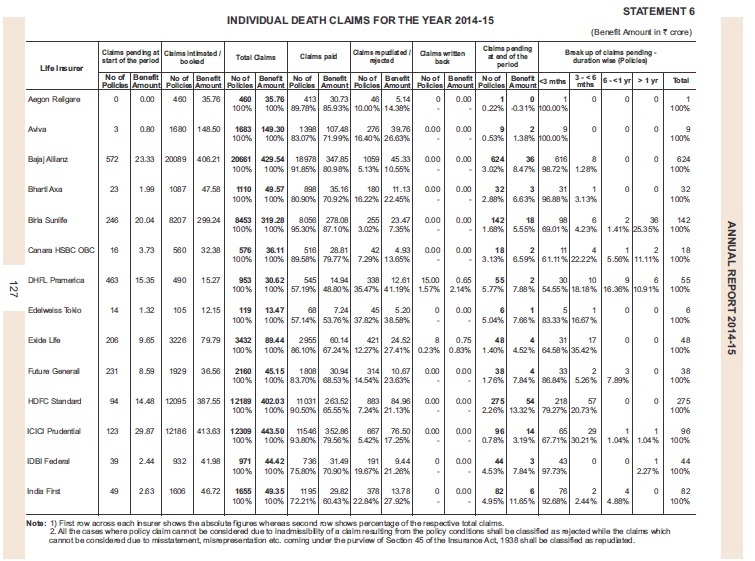 I am producing some of the highlights of the IRDA annual report about claim settlement ratios for 2014-15 pertaining to individual death claims. 1) Claim Settlement ratio of LIC is better than Private Life Insurance Companies. 2) LIC Claim Settlement Ratio has increased from 98.14% (2013-14) to 98.19% (2014-15). Repudiation (Rejections) has remained almost same and stands at 1.15% for 2014-15 compared to previous year. The difference between claim paid and repudiation (rejections) are proposals pending. 3) Private Insurers Claim Settlement Ratio has gone from 88.31% (2013-14) to 89.40% (2014-15). Repudiation has reduced from 8.03% (2013-14) to 7.78% (2014-15). Private Insurers repudiated 9,486 claims compared to LIC of 8,689. 4) Overall industry claim settlement ratio increased from 96.75% (2013-14) to 96.97% (2014-15). Overall industry repudiation remained same level at 2.08% in 2014-15 compared to previous year. 5) Some of the high claim settlement ratios companies for 2014-15 are listed below. Also Read: Which are the Top and Best Health Insurance Plans for 2016? 1) There are 53 insurance companies operating in India by end of Mar-2015, out of which 24 are in life insurance business and 28 in non life insurance business, 1 is GIC who is national re-insurer. 3) Single Premium Plans continue to play as major role and LIC gets 25% of its total premiums from these plans. 4) Unit linked insurance products (ULIPs) registered a growth of 10.85 per cent premium from Rs 37,544.08 crore in 2013-14 to Rs 41,616.94 crore in 2014-15. 5) Out of 24 life insurers operated for 2014-2015, 21 reported profits for the year. They are Aviva Life, Bajaj Allianz, Birla SunLife, Canara HSBC, DHFL Pramerica, Future Generali, EXIDE Life, HDFC Standard, ICICI Prudential, IDBI Federal, India First, Kotak Mahindra, Max Life, PNB MetLife, Reliance Life, Sahara India, SBI Life, Shriram Life, Tata AIA and LIC of India. (Indicated in alphabetical order). Also Read: United India Family Mediclaim Policy – What are its unique features? Conclusion: While Claim Settlement Ratio is not the only criteria, it is one of the key components in choosing a life insurance plan. Consider high claim settlement ratio insurance company. However, one cannot do anything if claim settlement ratios are coming down from previous year (where you would have brought insurance plans earlier). However, I observed, LIC and ICICI Life insurance companies where claim settlement ratios are always high and ranks in top-5. Good effort..However, Comparing LIC with private companies is not fare for the same FY. LIC is 50+ yr old and most of the claims would be non early claims whereas most of the claims of private companies are early which they are bound to investigate impacting claims settlement ratio. Thanks for this informative blog. I hold a HDFC Click2Protect term insurance. Are you aware of any fine prints for term insurance policies? You have mentioned claim settlement ratio of private insurers have gone down from 88.31% to 89.40%. There seems to be some mistake. It should have been gone up. Please correct it. Thanks Yash, I have corrected it. What do you do? Where are you investing your money?